The victim included two males and a female, who were apparently walking along the street when a vehicle pulled up and an armed male suspect got out of it. He began to fire multiple shots at the victims. 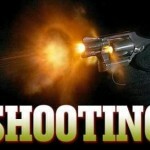 One male and the female were injured in their lower extremities with what were described as non-life threatening wounds. The remaining male was not injured. The SAPD did not release a description of the shooter. Nor did they reveal the names of the victims. The wounded juvenile victims were taken to a local hospital. Needless to say the shooting was described by the police as gang-related. This shooting happened in Santa Ana’s Ward 1, which is represented by Councilman Vince Sarmiento. Good. I hope all these little scumbag anchor babies kill each other. Less lives for me to pay for.